QWIK Cable 568A - 25 Pair Cable with 6 Legs - Oddball Wiring! QWIK Cable - 25 Pair with 6 Legs Wired 568A - Oddball Wiring! 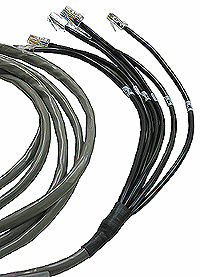 QWIK Cable™ 568A - 25 Pair Cable with 6 Legs - Oddball Wiring! 10' Long Overall Base Length.